Looking for ways to please your bored, grouchy toddler? Let them do what they do best – play outdoors! The truth is, outdoor activities in the early years are extremely beneficial. Getting out, even just into the back yard, helps your child burn off excess energy and fresh air is great for their mind and body. 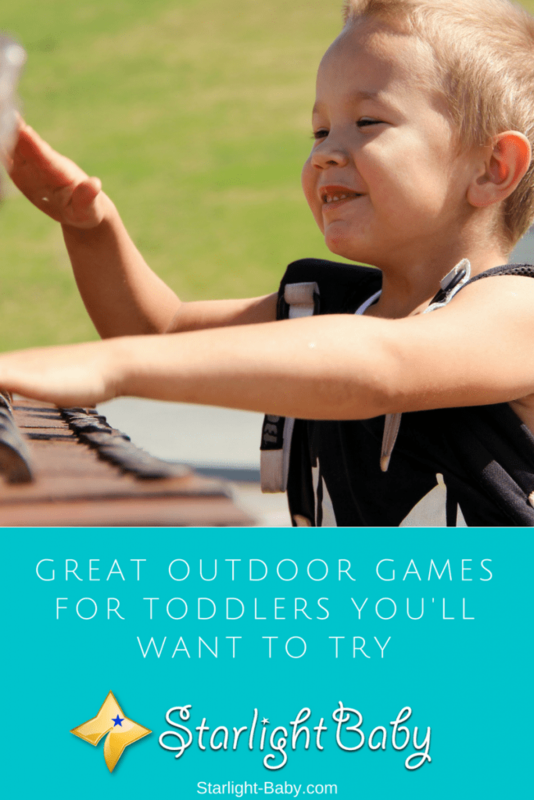 There’s plenty of outdoor games you can introduce to help keep them entertained for hours. If you’re struggling to come up with a new outdoor activity, below you’ll discover some great games for toddlers to play outside; guaranteed to keep them happy! Never underestimate the power of water for keeping toddlers entertained! On a particularly nice day, fill up a bucket with warm water, add a little baby shampoo to make it nice and soapy, then drop in a clean sponge. They can use this to clean their outdoor toys, such as tricycles, scooters, slides and bikes. You’ll be surprised just how much toddlers love to do grown up things like cleaning their toys. Once they’ve all been washed, you can give them a hose to wash the toys down, then dry them with paper towels. Not only will this keep your little one entertained, but it’ll also eliminate one task from your never ending to-do list. Why not join in on the fun and play the popular “Freeze” game? Take a portable music player into the back yard and when it’s playing, you and your toddler can dance your heart out. The sillier the dancing, the more fun this game will be. Then, when the music stops, you both need to freeze until it starts again. Why not try to see who can freeze in the silliest pose? This is another very simple, yet extremely fun game that the whole family can enjoy. So, if you’re looking for an outside activity which allows you to bond with your toddler, this is definitely one of the best to try. Toddlers love anything messy, so painting with a squirt gun is going to really please your little one. All you need is a portable chalk or drawing board which you can hang blank sheets of paper on, along with paint and a squirt gun. They can then use the squirt gun to paint onto the paper. It’s a messy game, but one that’s going to keep your toddler happy for a long time. Obviously, you’ll want to make sure the paint you use in the gun is toddler-friendly to avoid potentially needing to rush to hospital! Your toddler already likely knows all about the famous “The Very Hungry Caterpillar”, so imagine their delight being able to play caterpillar hopscotch. All you need to do is draw quite a large circle for the head with chalk, adding antennae and a face. Then, create around 20, or less if space is an issue, smaller circles for the body. Obviously, your toddler might not be able to do the hopping from one circle to another. If they are a little too young for that right now, simply challenge them to run across the entire caterpillar in the fastest time. You can use a stopwatch to make it more exciting. If your toddler is hold enough to understand different colors, you can also color the caterpillar in and create a game where they need to jump to different colors. There are so many ways this game can be played that it provides literally hours of fun. Another simple idea you can use if you’ve got chalk, is to let your toddler use the driveway or walkway into their own personal canvas. You’ll need fairly strong sidewalk chalk for this to work, and the more colors you can find the better. Once they’ve created their masterpiece, you can simply wash it off and let them start again. You can also use this as a learning game, drawing animals for example and getting your toddler to tell you which noises each one makes. Or drawing shapes, numbers or letters together. We’ve already covered a fun painting game with the squirt gun, but another fantastic idea your toddler will love is to use water balloons. Fill them with different colored paints and let your little one throw them down onto paper, the lawn or the driveway. Just be sure you’re using paint which can easily be washed off! Make this game even more fun by inviting your toddler’s friends around for a paint party. They’ll have so much fun using the water balloons. Just remember to supervise them and that they wear clothing you and the other parents don’t mind getting a little messy! It’s like an unspeakable law that toddlers LOVE bubbles. You can easily pick up tubs of bubbles, or create your own, and it’s really affordable too. Blow bubbles together in the yard, or get your toddler to chase them. If you have a dog, you’ll also notice they too love bubbles and your toddler will find it hilarious watching them jump up to catch them. If you want to take this idea a step further, why not fill up a tiny plastic pool full of bubbles? This is an especially great idea if you have a group of toddlers to entertain. Again, just be sure to supervise them around the pool as accidents can happen, even if there’s only a little water. The bear game is extremely popular with toddlers and is so simple to play. First, get your little one to place three objects of their choosing out in front of them. Then, get them to hide underneath a blanket, pretending to sleep. They’ll need their eyes closed here so be sure to check they aren’t peeking! Once you’re confident they are pretending to sleep, either you or another child, can hide one of the objects. Yell “wake up” to get your toddler to open their eyes and then tell you which object is missing. If there’s more than two of you playing this game, you can also get them to guess who the sneaky bear was who stole the object. Once they’ve guessed which item is missing, you can then have a turn so your toddler has a chance to hide something. It’s possible to make the bear game a little more difficult and actually get your little one to search for the missing item. Overall, there’s so many things you can do with your toddler outside and the above are just a small selection. Do you have your own inventive outdoor games you’d like to share? Add yours to the comments section below, we’d love to hear them! I loved this blog article! Reading it through to the end brings back precious happy memories with my little ones, now, grown ups. They loved gardening with me… digging for worms… slaters… mud pies, water splashes… running in the ‘wild’ on our 10-acre land… tree houses… tire swings… fruit tree picking… Rafting on our dam (small lake) was one of our best times. Catching yabbies (little creek lobsters). Aw, it’s so nice to think about isn’t it? It’s interesting how some of the memories we treasure the most are the little ones like these. They may not seem as significant to others, but to us they mean the world. Another fun game is Duck Duck Goose. This one is quite popular with young children. My young niece also loves to play in my backyard. She loves to water the flowers and sometimes she helps me hang up the laundry outside (although I have to pick her up for her to reach the laundry pole). Outdoor games are fun, but we have to watch the kids carefully because they tend to trip and fall easily. Sometimes they’ll chase after a ball and run into the streets. We don’t want any accidents to happen so it’s important to watch the kids carefully when they’re playing outside. Yes kataomoi, the child’s safety should always be considered when playing outside the house. A parent should never take his/her eyes off a child when outside the house, playing or not. The child could wander into the street anytime in seconds. Some are lucky to have fences in their backyard, and grass on the lawn/garden that could help protect a child from scratches if he/she trips while playing. Very good ideas for games. We already use the blowing bubbles together one! It’s amazing fun. What we do is we always make our own bubble mixture which is done very easily. Our is made out of the water, any kind of soap and a tiny bit of sugar then you mix all these three ingredients together and go outside and blow some bubbles. He really loves popping those extra big ones, haha. I think it’s also a good exercise sort of activity since he has to run after some of them or jump high in the air to reach and be able to pop the bubbles. The driveway one is also very good fun. We did that as children all the time. We didn’t have any of these fancy, expensive toys yet so we had to be creative. We drew all sort of things on the sidewalks and driveways. Even one of those jumping with the one-foot game? I forgot its name. Just make sure to give them many colorful chalks – that will increase the fun level! This brings back happy childhood memories, doesn’t it, Jane Lee? Don’t you just miss those days when children get to be creative and play in the outdoors? These days, kids are busy with gadgets and computers. Some even do not have an idea about what these games are, that is why I do my best to encourage my two young daughters to play with real toys and play real games. Gardening can become a fun activity for toddlers. I have invited my nephew and nice to participate in gardening and they loved this. My child will become a toddler next year and I will have to introduce fun activities to entertain and educate him. Thanks for sharing these great ideas. I think my baby will like to use the driveway as a drawing board and blowing bubbles. I want to add some more points here. My son will have his first birth on May 21. He cannot walk properly yet, however, he likes to chase farm animals (we live in a farm). Chasing farm animals is a good game for my child. My boy also likes to play in the water, I have a kiddie pool and water toys. Pool time is the best time for my child.